Born in Braine l’Alleud in Belgium in 1980. Graduated with honors from the Ecole des Beaux-Arts in Paris in 2007. 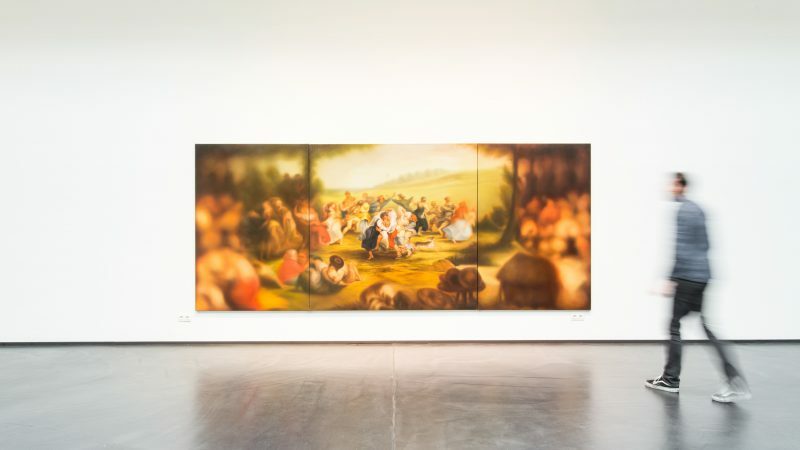 Antoine Roegiers’ characteristic technique of the past few years was inspired by the classic Old Masters: Peter Paul Rubens, Pieter Breughel, Hieronymus Bosch and Guido Reni. Roegiers sees them as his artistic fathers and lets himself be guided by the works of his deceased mentors. He takes details from the grand but at times grandiose paintings of Rubens and reformulates them into new, autonomous compositions which seem to be in full movement, as we can see in Le Baiser. The spectator is literally forced to focus his gaze onto the frozen image amidst all that movement. He purposely leaves the edges blurred to direct all the attention to one particular detail or situation. It’s like a clair-obscur reminiscent of the baroque artists who applied this technique to ‘lighten up’ the part that stirs the imagination the most. Contemporary painting in the 21st century allows for this transformation of well-known paintings from a bygone era in accordance with a new and contemporary vision and thus for a new generation. Video is another fundamental element in his work. As a true pioneer he uses the medium in a very meticulous way. His first animated painting, L’académie (2005), was a 2’15” long clip inspired by a small painting, Paysans, by the painter’s trio Le Nain from the Louvre where he often went. This gave him the idea to surprise the spectator by letting added figures move in existing scenes. The mystery was born. Every video-piece is a sequence of handmade drawings, like his Paysages Vides (après Breughel), which are deserted Breughel landscapes. This work is yet another way of showing the Old Masters to a new audience through a contemporary story.